In spite of the huffing and puffing that we see in the media space…is it not stunning how it is that the intelligentsia has hardly been able to translate that into thinking and positioning itself onto gaining more foothold in the arena of power?…Of what use is this knowledge often professed, if it does not energise action into delivering value for the community? The 2019 presidential election is turning out to be unlike any other before it. A few weeks to the poll, there is some feeling of fait accompli in the air. There is this queer quiet in the camp of the ‘the main opposition party’, as a section of the Nigerian media has labelled it, but for punctuations of disjointed, ridiculous press statements issued more to amuse than raise any issue of serious concern. When you obsess with power and moneybags as the formula for success, insisting on building from the roof rather than the bottom, strange things happen. Who knows, it just might be a part of the ‘Dubai strategy’ to confuse the opponent with a lacklustre start to the campaign, only to launch out with force towards the end of the game. Whatever it is they are articulating, we can only wish them well. As for the ‘Third Force’, the different variants of which we’ve seen, it has turned out to be exactly what we called it – mere smoke, founded on nothing but paltry wishes. Some of the most vociferous voices of the version cooked in Abeokuta have predictably moved into more prosperous alliances. The spokesperson of the third force yesterday now speaks for the old force today. It is that easy. The idealists are all over the place, as we predicted. With the proponents unable to die to self, it was inevitable that the PACT would fall apart. The umpire for the day is now the presidential candidate of a party, which makes the pretence at presiding over the process of forging a common front even more laughable. In 2016, I argued that “… the problem with Nigeria is not an insufficiency of political platforms or parties through which one can ventilate one’s political philosophy or actualise the ambition for power; our problem, in fact, is the ease with which we take to charting our own course, seeking to singularly take on a new path rather than joining hands to build one house and not dissipating energy in different directions.” Looking at what has become of the effort of the ‘progressives’ outside the dominant parties to make impact, again, I have been proved right. The inability to coalesce, to die to self and forge a consensus has made nonsense of the desire, genuine on the part of some, to cause a paradigm shift. Sadly, each one has taken it as if it is as simple as about going it alone, not realising that only weakens the collective and the overall objective. Easily, we lose sight of the value that can only come from working together as one. Àgbájọ ọwọ́ la fí nsọ̀yà, ọwọ́ kan kò gbẹ́rù d’órí. For the overriding knowledge about every subject, governance and politics inclusive, that a section of Nigeria’s intellectuals likes to arrogate to itself, looking down on every other group in the process, is it not ironic to see how often it runs short of achieving anything tangible, as a collective? In spite of the huffing and puffing that we see in the media space, in the name of public intellection, is it not stunning how it is that the intelligentsia has hardly been able to translate that into thinking and positioning itself onto gaining more foothold in the arena of power? One might ask: Of what use is this knowledge often professed, if it does not energise action into delivering value for the community? Of what use if it cannot be deployed with the aid of the necessary emotional intelligence to initiate change? It is easy to criticise from afar, but it is in putting in the necessary shift to strategise and organise that the questions challenge us. In place of strategic thinking, these ‘totalitarian intellectuals’ will rather embrace with chronic cynicism, in the strange assumption that patriotism is all about criticism, even when there is inadequate or no knowledge of the subject at hand. In their minds, to suggest pragmatism in thought and engagement, to analyse outside the narrow framework of beating up Nigeria, is to be ‘providing talking points for the oppressors’, as one of them put it. For the ‘intellectuals’ to get involved in the governance process, in their closed minds, is a betrayal of the ‘cause’, when, in fact, some of them not only scout, behind the scene, for opportunities to ‘serve,’ but had indeed serviced other governments in the past, to no better outcomes than the ones they routinely criticise. Some of the lead actors in the unrelenting demonisation exercise of anyone not seen to echo them are, in fact, still giddy with the stale wine of 2015. They are only able to see through the corrupt lens of yesterday and every action of today is mandatorily processed through the mill around their necks, with only one possible outcome. In their words, ‘there is evil in the land on account of the acquiescence of the South-West intellectuals, who are only looking out for their own serving in government’. Cheap shots from a coterie of ‘totalitarian intellectuals’ unable to overcome the disappointment of 2015 in which they invested themselves in a choice that did not resonate with majority. They have now taken refuge under the tattered umbrella of ethnocentrism, in pretend-patriotism. Some of them, tucked away in the safety of the diaspora, spend their time preaching hate online, fiddling with our fault lines, in desperation to rewrite 2015 and muddy 2019, seeing that the outcome is beyond the pedestrian analysis they generously hawked only yesterday. 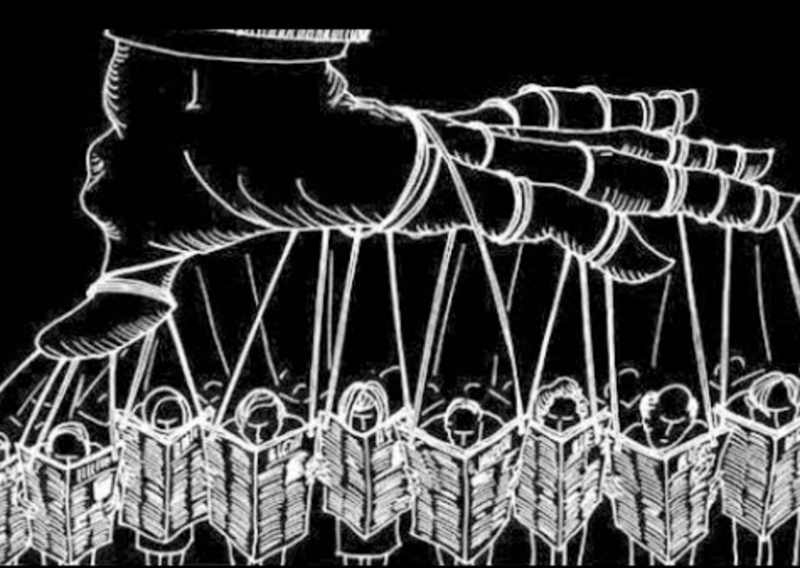 They feed on fiction as basis for stifling and polluting reality. They have worn themselves the garb of a higher form of patriotism and to not endorse their choices or fly with their fake wings is to be not patriotic, it is to be acting out of bigotry, or how else do you explain this demonisation of so-called South-West intellectuals?. One of our diaspora ‘professors’, at his morbid worst, pronounces Professor Wole Soyinka ‘dead’, on the strength of his “The man dies in all who keep silent in the face of tyranny,” since according to him, the 84 year old Nobel laureate has been silent “in the midst of Buhari’s current asphyxiating tyranny”. If we humour ‘professor’ with the garb of locus, of which he is most unqualified for, it must then be that the gentleman has been in deep slumber to have missed out on the series of intervention on the part of this statesman, who doesn’t owes him or any person any explanation on when to speak or hold his silence. Expectedly, the ‘experts’, especially those free-market lapdogs unleashed on the system to regurgitate what had been pumped into them elsewhere, without a thought for our socio-cultural idiosyncrasies and systemic peculiarities, especially with an economy largely informal, have been up in arms. How ironic that the same ones who profess to be intellectuals can so easily forget that there is a plurality to thought and that the fact that they claim to be minded by their own convictions should make them extend such benefit to others as well, who might just be acting out their convictions, rather than engage in petty tyranny, dictating to others when and what to write or not write, even how to write it. In the case of our ‘professor’, he does not stop at dictating to others what they should write, it extends to what they wear. He declares Minister Solomon Dalung an “unhinged, empty-brained charlatan” for his ceremonial attire to a Tarok event in Plateau state. That is the new face of tyranny by a Social Media Elite (SME) drunk on the wine of adulation from an audience unable to dig deeper beyond the few words fed them. No-one says President Buhari has gotten everything right. He has not done as well as he could have. He missed an opportunity, at the beginning, to take firm charge, but for his aloofness with the nitty-gritty of party politics which inevitably led to the emergence of the take-over of the legislature by amphibians, which has impacted negatively on the pursuit of his agenda. He also was unmindful of the mechanics of the reward system in politics which left many of those who served as foot-soldiers in his emergence in the cold, while old hands remained in charge of some agencies of government, with telling effects on governance and performance. In spite of the missteps and lapses, what the president has going for him is an army of supporters and believers who see what he is doing, where he is headed and have sworn to support him achieve these. They have not said he has no faults or that in many instances, things could not have been done differently. To demonise people, simply for their political choice and label them as stupid does not speak of good upbringing, which is the hallmark of an ‘Omoluabi’, which one would expect will come with proper education. For some of us, the 2015 elections was as much about the political argument as it was about the need for a different economic philosophy, and we did say so. It was about ensuring there was a shift of emphasis from the top to the bottom of the pyramid in the focus of the government. That is why when the present administration seemed, at a point, to have been taking its time in kicking off the social intervention programme, we had to publicly remind it on the need to keep to its promise and plan, as that was one of the reasons some of us supported its emergence. It is remarkable that between 2016 and now, in spite of the late start and hiccups with appropriation and implementation, about N250 billion is reported to have been committed to social investment programmes (SIPs), which have impacted about nine million Nigerians. Expectedly, the ‘experts’, especially those free-market lapdogs unleashed on the system to regurgitate what had been pumped into them elsewhere, without a thought for our socio-cultural idiosyncrasies and systemic peculiarities, especially with an economy largely informal, have been up in arms. As I had argued here, once the issue gets to funding social protection and addressing inequality, experts flare up. They argue against hand-out for the poor. But what constitutes hand-outs? Bailing out banks with over one trillion naira is no hand-out, they will tell us. It makes sense to them to write off debts incurred by the people at the top, waive import duties, grant the rich tax holiday and subsidise their lives of luxury, but when the government seeks to put N5000 in the hands of the poor, these experts get jittery. They do the arithmetic and quickly tell us how unsustainable such policy is. Their haughty assumption is that it is simply about handing over cash to some laid-back, poor people, who will simply recoil into lethargy once cash is put into their hands. They assume there is some superior knowledge on the part of the elite in running business for profit, and that those at the bottom of the pyramid, who without formal support have been running their small businesses, are incapable of taking advantage of capital injection, no matter how little. It is that supercilious attitude of these ‘experts’ that make them unable to see the link between a spike in the price of petrol and the micro-enterprises, such as vulcanising, barbing, and even the semi-formal businesses; so they argue, in obeisance to the textbook that petrol pricing be left to the market, at a time when supply is still largely met through importation, with all its attendant vagaries. They cannot see the impact on the transportation of goods and services, especially in the informal sector. They are incapable of connecting the dots to see that whatever assistance extended towards the most vulnerable through properly engineered social protection schemes can only free them to add value, even from the bottom, making growth and development more inclusive. That haughty spirit runs through their appraisal of the schemes under the SIP. They cannot connect the dots between the Conditional Cash Transfer scheme and the immunisation programme, even when such programmes have the buy-in and involvement of the World Bank and they have been successfully run in other parts of the world. They cannot see the relationship between the schools feeding programme and the value/supply chain spun at the bottom of the pyramid. They cannot see the sense in advancing interest-free loans of between N10,000 and N100,000, either as Marketmoni or Tradermoni, to market women, traders, artisans, and farmers at the bottom of the pyramid – a programme executed through the Bank of Industry. They will rather derisively dismiss the initiative as a vote-buying scheme. They cannot see what the Anchor Borrowers programme has done to give fillip to rice farming, among others. To highlight gains and wins here and there with infrastructure projects, some of which had been long abandoned, is to be deemed unpatriotic. To acknowledge that pensioners, such as those of the defunct Nigerian Airways, who had been owed pensions since the Obasanjo era have now been paid N22 billion by the Buhari administration is to utter heresy. To say that the situation in 2015 was such that about two-thirds of the states had not paid their workers for many months and that through the bail-out fund and Paris Club refund from the federal government, the grim situation was remedied, is to be anti-intellectual. We must dismiss the N-Power programme that we might be able to retain our badge of honour. It has to always be doom and gloom, otherwise they would not be pleased. That haughtiness runs through, not just in the manner this section of the elite dismiss the essence and impact of the SIP and the Anchor Borrowers Programme by the Central Bank of Nigeria, it is evident in the snide remarks they make about the person of President Muhammadu Buhari. He apparently does not fit their perverted understanding of who qualifies to lead the country, given his ascetic outlook on life and an unwillingness to cater to the indulgences of those who believe they matter. There are different elements and variants to the disdain, with different caricatures created of the man, to make of him what he is not. The vilest of them publicly wished for his death, while the most gullible believe the lie that the man who occupies the office as Muhammadu Buhari is, in fact, a clone or body-double from Sudan. The confusion within their rank is evident in their muddled understanding of the legs upon which the cult-following Muhammadu Buhari enjoys among the people at the bottom of the pyramid rests. They struggle to understand how, in spite of the resources and energy invested in rewriting history and demonising the man, he continues to stand on a firm ground, with his base largely intact, even when he does not deploy resources like others to oil the structure. If the section of the elite that has been restive on account of the emergence of President Buhari was more introspective, they would have invested themselves in a sober interrogation of the phenomenon but arrogance and lack of rigour won’t let them. They will rather remain consumed by the desire for power, unmindful of the fact that their lack of emotional intelligence, inability to see that the times have changed, and thus failing to connect the dots, will continue to do them in, reinforcing their frustration. That this category of intellectuals cannot properly read the Buhari phenomenon in Nigerian politics for what it is, reading themselves into their analyses in the most subjective manner, is not as strange as the fact that they are unable to gracefully accept the failure of their hypotheses. That there is a fanatical belief in Muhammadu Buhari by a large section of those at the bottom, especially in the North, should be easy to see. That confers on him an advantage, given the demographics and the higher level of political consciousness and participation in the region. One would think that the intellectual would be more invested in seeking an understanding of this, rather than resorting to habitual tantrums and insults, as has been the case. I doubt that any Nigerian leader has been able to directly connect with the minds and souls of Nigerians at the bottom of the pyramid as Muhammadu Buhari has been able to, since the days of Obafemi Awolowo, Aminu Kano and the phenomenal M.K.O Abiola. That should interest the analytical mind. As had been argued here over a year ago, barring a case of force majeure and/or unprecedented developments that can dramatically impact the election, the incumbent president is set to be returned for a second term in office. He would, in fact do better across the six regions than he did in 2015, except for the North-Central. His performance will be better in both the South-East and South-South, where he did not do that well in the 2015 elections. That is something to say, given the vociferous campaign mounted to discredit his person and the administration he leads in the last three years. But it would appear that a lot of what used to fabricate at the top, that would so easily percolate to the bottom, no longer do so, as in time past. That must be reason for the panic and frustration in the circle of these ones who lay claim to a superior form of patriotism. But 2019 will send the men of yesterday, rattled by the loss of influence which they used to have, into a most needed retirement. If they have not taken a cue from the nothing that became of the Third Force, the result of the 2019 presidential election should help them. However, it would be foolhardy to expect same for the ‘intellectual wing’. If as at now, some are yet to get over 2015, what do we expect? They are already in the process of building up an alibi for that which, in their mind, they know to be inevitable. Even then, they never accept defeat. They don’t take the majority speaking a different language well. They always find a way to rationalise their loss, blaming everyone else but themselves. Totalitarian intellectuals are never wrong. That must be reason for their unending frustration.